Buy Pirate Print Kids Trolley Bags from Center Kids Backpack Bag Manufacturer in China, two compartment, quality handle trolley with smooth wheels. 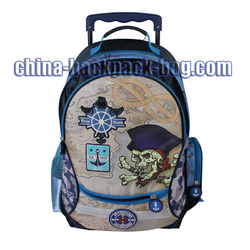 Name: Pirate Print Kids Trolley Bags. 3.Quality handle trolley with smooth wheels. 4.Two side pockets for water bottle or other items. 5.Two main compartment with a smaller front zip pocket. 6.For safety, adding reflective strap.